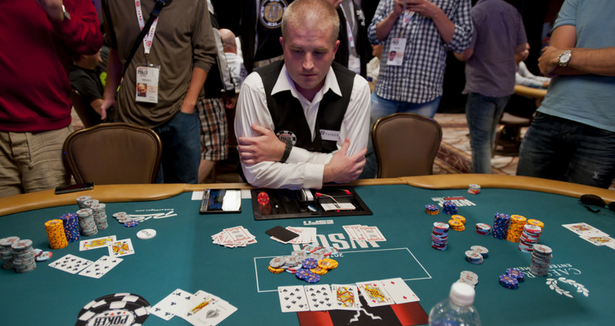 The $50k Poker Player Championship is considered one of the more prestigious events at the World Series of Poker, so there is no surprise that player’s emotions run high during critical all-in moments. Mix in one part bizarre floor rulings and you have a recipe for instant drama. It all started at table 360 during the Pot-Limit Omaha round with Charles Pacheco limping in under the gun. Viktor Blom, Abe Mosseri and Shaun Deeb all elected to limp, with John D’Agostino completing the small blind to join the hand. Nicolai Yakovenko, the big blind, then raised the pot to 12,400. All players proceeded to call until it got round to Deeb, who announced all-in for 68,000. D’Agostino got out of the way but Yakovenko then stated he too was all-in, despite having slightly more then a pot-sized bet. Pacheco and Blom mucked their hands and it was up to Mosseri, who took some time to make the call. During this time, Mosseri announced that he held Aces with one suit. Yakovenko protested him talking about his hand and even accused Mosseri of “polling his friends” in order to make a decision. Eventually, Yakovenko, who was obviously flustered by the turn of events, called the clock on him. Mosseri was visibly shocked and declared it was the first time in his life that anyone had called the clock on him. Mosseri finally made the call and all three players revealed their hands. The board ran out [QS], [JD], [2D], [10S], [8S] and, at first, it looked like Deeb was set to triple up with a Q-high spade flush with Mosseri taking the side pot. Yakovenko then made it clear that Mosseri only called so he was not entirely all-in. The floor staff was summoned with the dealer explaining that the hands were mistakenly tabled as if both Deeb and Yakovenko was all-in. After all the calculations were made, the floor initially ruled that since the flop action was not completed after the flop, the dealer would have to re-draw the tun and river. By now, a crowd had gathered around the table and upon hearing the ruling there were audible gasps and immediate protests. Deeb even proclaimed that he would not accept that decision and wanted to hear the opinion of the WSOP Tournament Director, Jack Effel. However, Effel had already left for the day so the lead floor supervisor came over to inspect the proceedings. After discussing the hand with the dealer and all the players involved, the floor reversed the initial decision by ruling there was “accepted action” by each player that all the money was in the middle, despite Mosseri only saying he called. Yakovenko then was forced to match all of Mosseri’s stack instead of the 60% it would have cost him on a proper pot-sized reraise. He was then left with only 15k chips and went out the next hand.